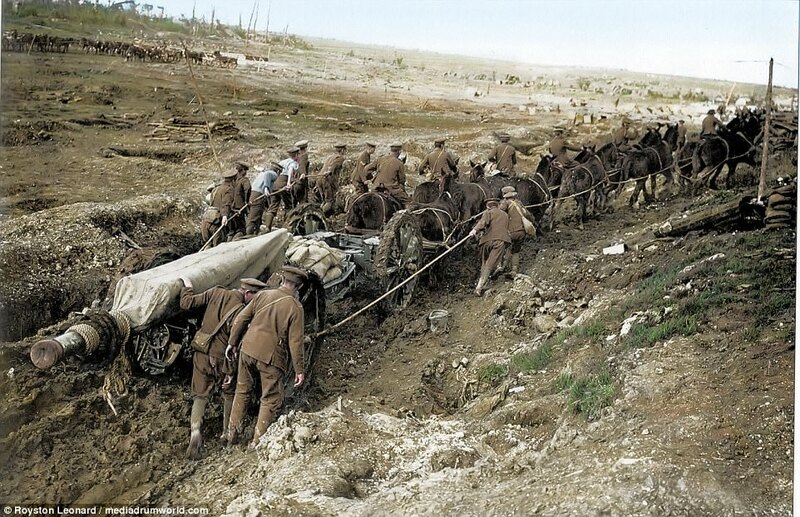 The devastation of World War One is laid bare in these striking photographs which show a soldier with shellshock, horses and men hauling massive guns through thick and clinging mud and troops tending to their injured comrades and going on deadly reconnaissance missions. 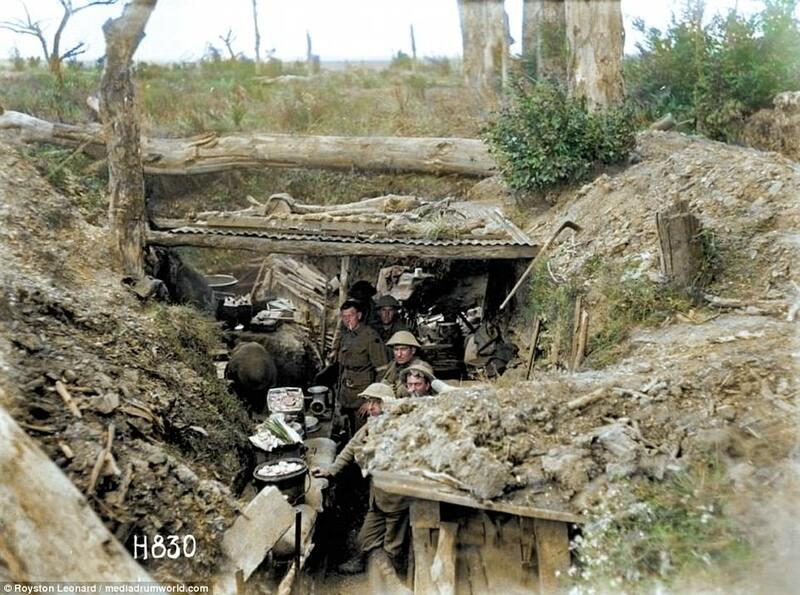 Some of the shots show soldiers sitting in a trench at the Battle of the Somme, checking on the wounded and dead among splintered trees and rubble-covered ground. 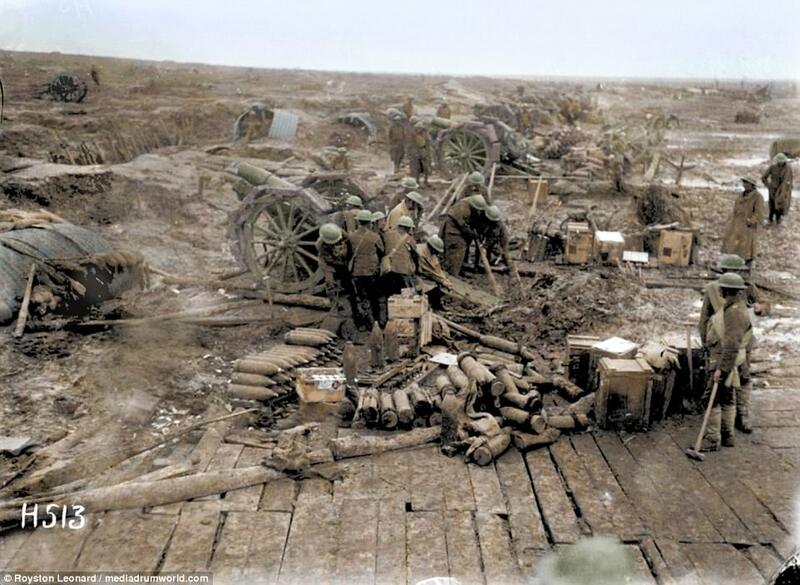 Other pictures show the hard slog of 60lb guns being hauled to the front at the Somme, the Divisional Cyclist Company loading up their bicycles and Canadian machine gun crews taking cover at Vimy Ridge. 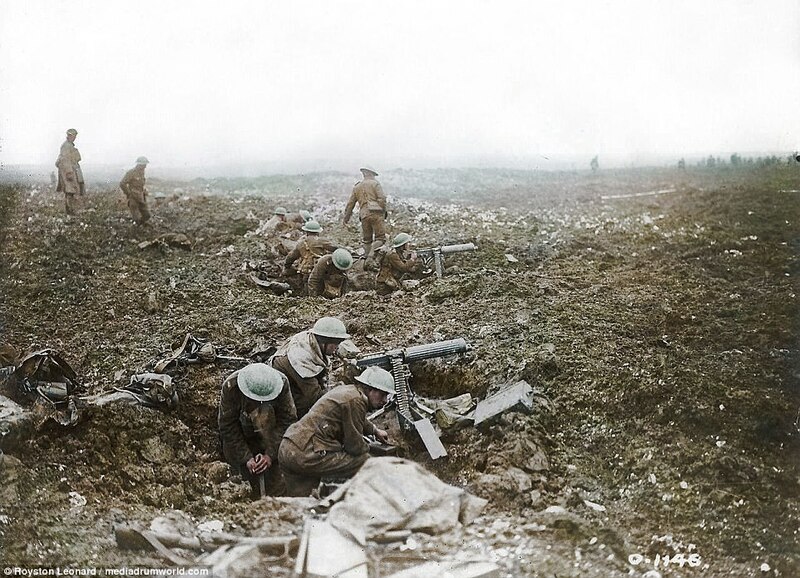 The Battle of the Somme, also known as the Somme Offensive, was one of the largest battles of the First World War. 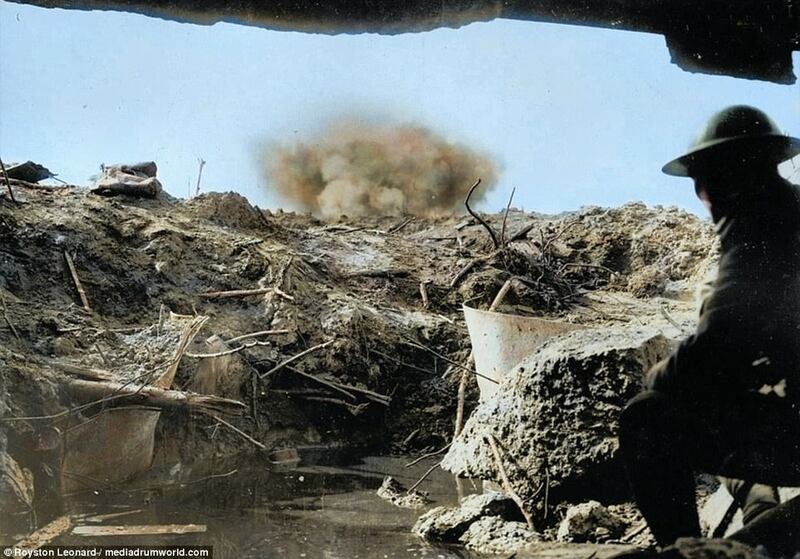 Fought between July 1 and November 1, 1916, near the Somme River in France, it was also one of the bloodiest military battles in history. 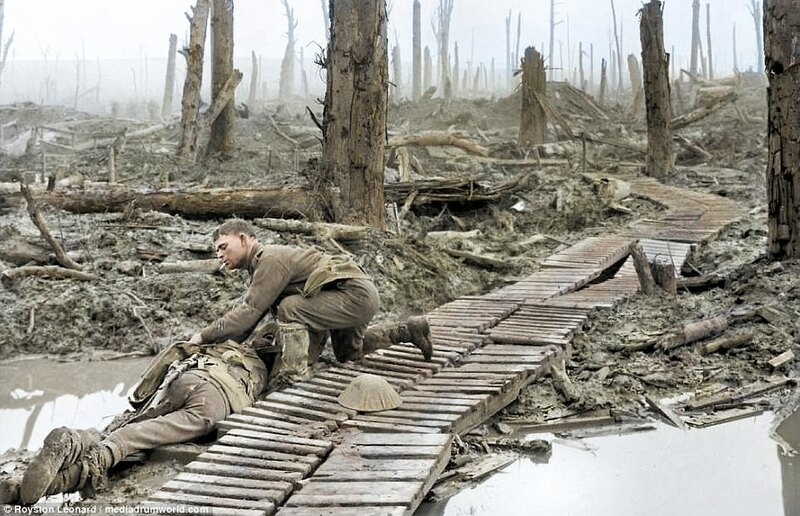 On the first day alone, the British suffered more than 57,000 casualties, and by the end of the campaign the Allies and Central Powers would lose more than 1.5 million men. 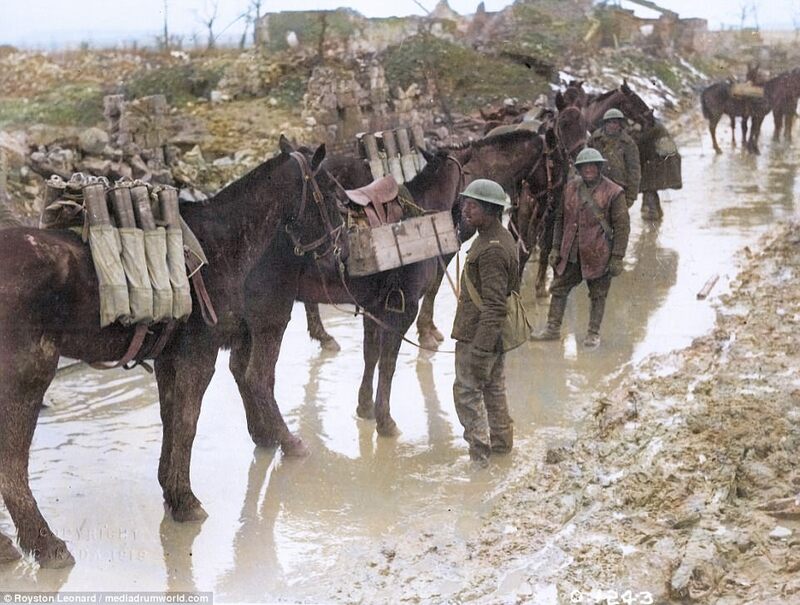 The original black and white photographs were painstakingly colourised over a number of months by electrician Royston Leonard, 55, from Cardiff, south Wales, and bring to life the stark reality of life in the trenches of the First World War. 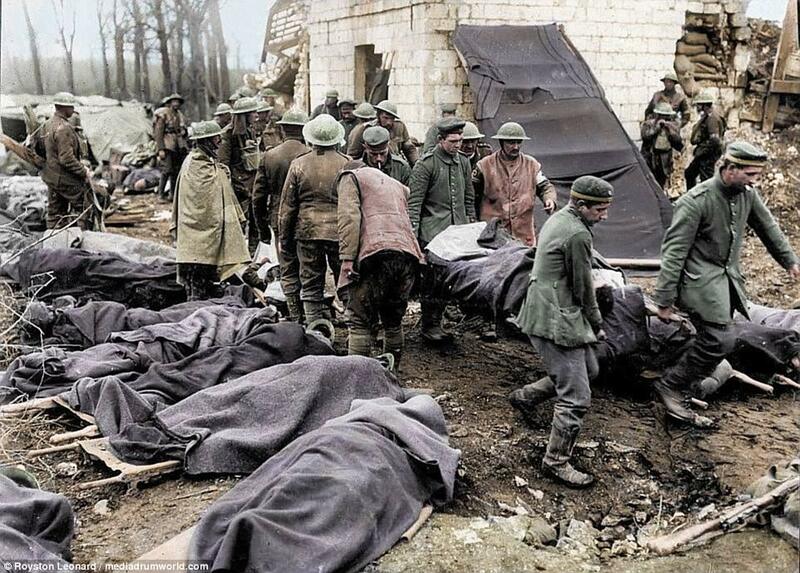 'Some would say that the First World War is when the old world died,' he said. 'From the hell of the battle fields came new ideas, but it is a pity most were about new ways of killing. 'New machines were made for the air and ground, but also mixed in were new ideas for peace and the way forwards to a better world. It would take another war to learn these lessons and finally bring peace to Europe. 'Even in the middle of hell you can see the hope of better times, but in some images it is just hell - man's hell made of blood death and steel. 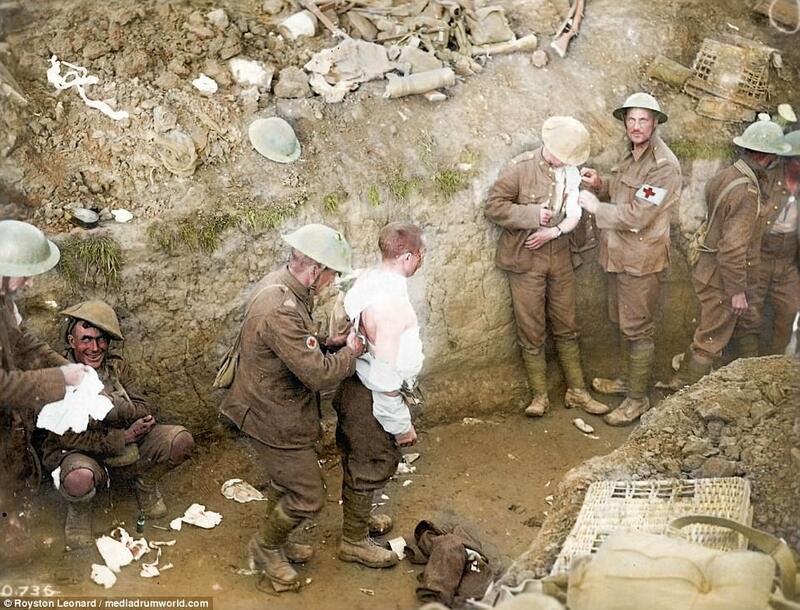 World War One was a global war originating in Europe that lasted from 28 July 1914 to 11 November 1918. More than 70 million military personnel, including 60 million Europeans, were mobilised in one of the largest wars in history. The total number of military and civilian casualties in World War I was more than 41 million: there were over 18 million deaths and 23 million wounded, ranking it among the deadliest conflicts in human history. The total number of deaths includes from 9 to 11 million military personnel and about 5 to 6 million civilians. The Allies lost about 6 million military personnel while the Central Powers lost about 4 million. At least 2 million died from diseases and 6 million went missing, presumed dead. 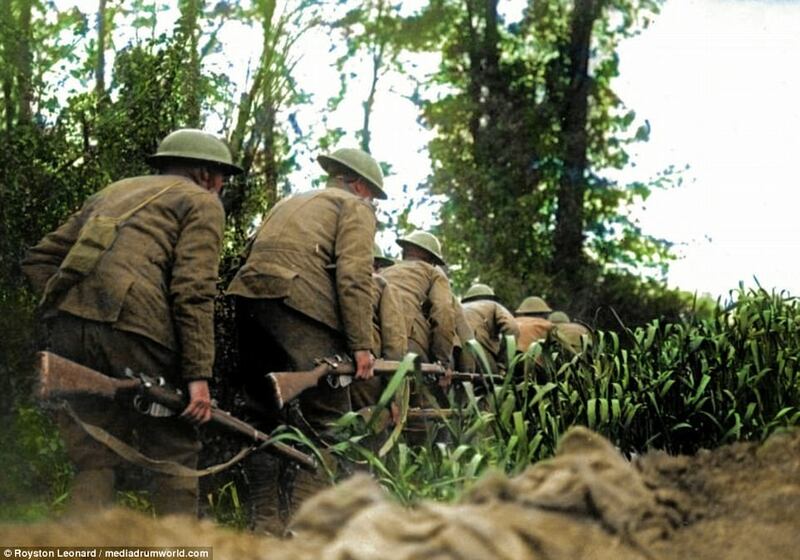 The casualty rate was exacerbated by the tactical stalemate caused by gruelling trench warfare. It was one of the deadliest conflicts in history, and paved the way for major political changes, including revolutions in many of the nations involved. Unresolved rivalries still extant at the end of the conflict contributed to the start of the Second World War only twenty-one years later. 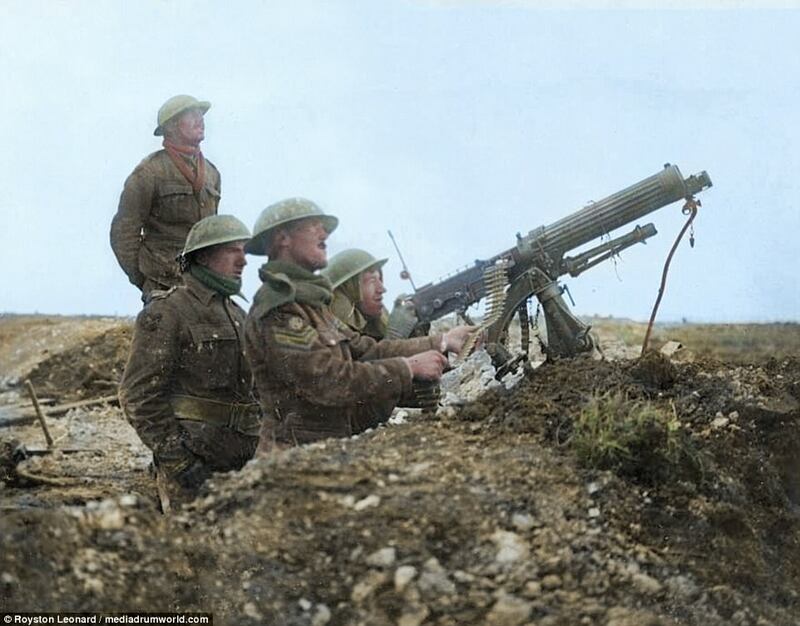 Striking images like these are featured in British author Michael D. Carroll's new book, Retrographic on the colourisation of historical images. It is available on Amazon now for £16.85.